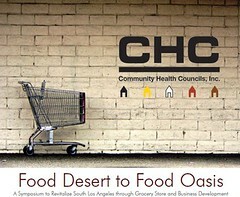 “Food Desert to Food Oasis” is a symposium to revitalize South Los Angeles through grocery store and business development to be held April 8-9 at The California Endowment, Center for Healthy Communities. The Symposium will stimulate dialogue among government, private investment, grocery store retailers, developers and community-based organizations to find tangible solutions to attract grocery stores and other businesses to South Los Angeles. Tags: California Endowment, Center for Healthy Communities, Events, Health, Small Business, South L.A. Supervisor Seeks $10,000 Reward In 'Hit & Run Death' Of USC S... Are You Paying Too Much Property Tax?